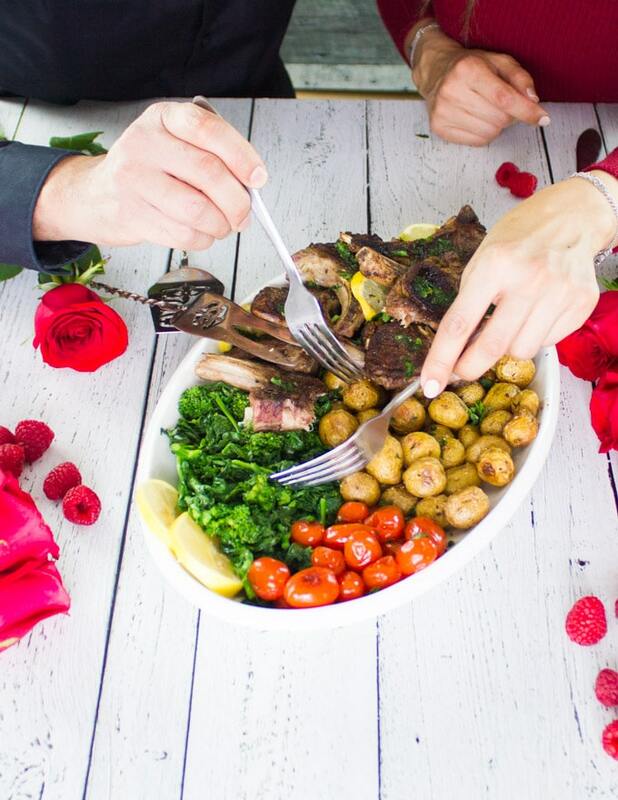 Have you tried Lamb Chops for Valentine’s Day yet? 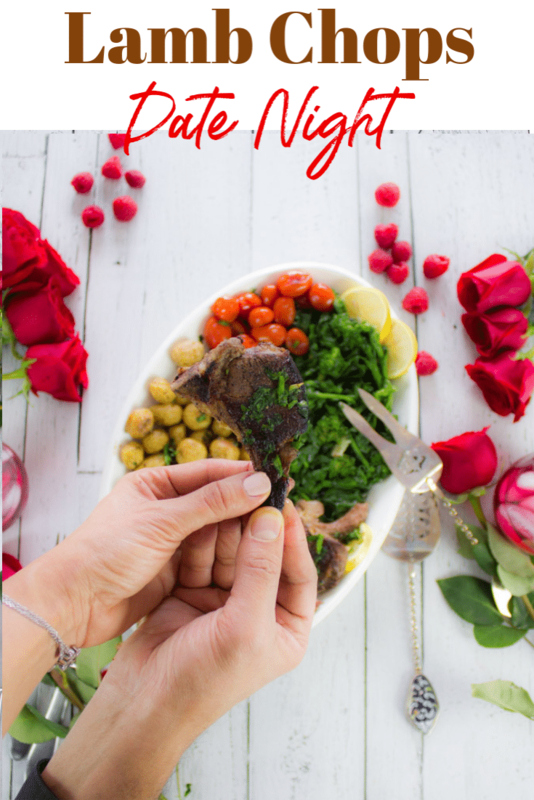 They’re succulent, delicious, easy to prepare and serious date night food! 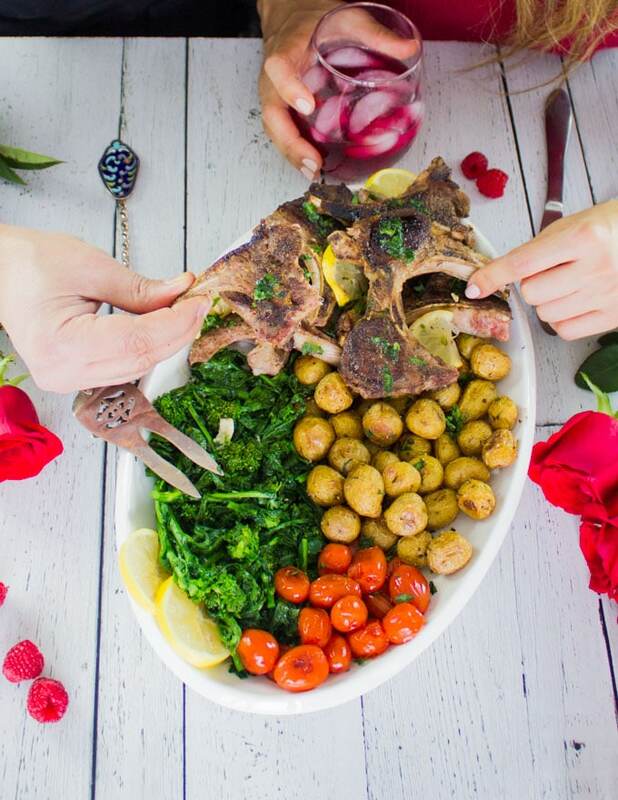 I’ll walk you through how to make this mouthwatering lamb chops platter for the most special meal! Today’s succulent post is sponsored by my friends at the American Lamb Board. All opinions and thoughts are my own. More lamb love and lamb recipes coming your way. 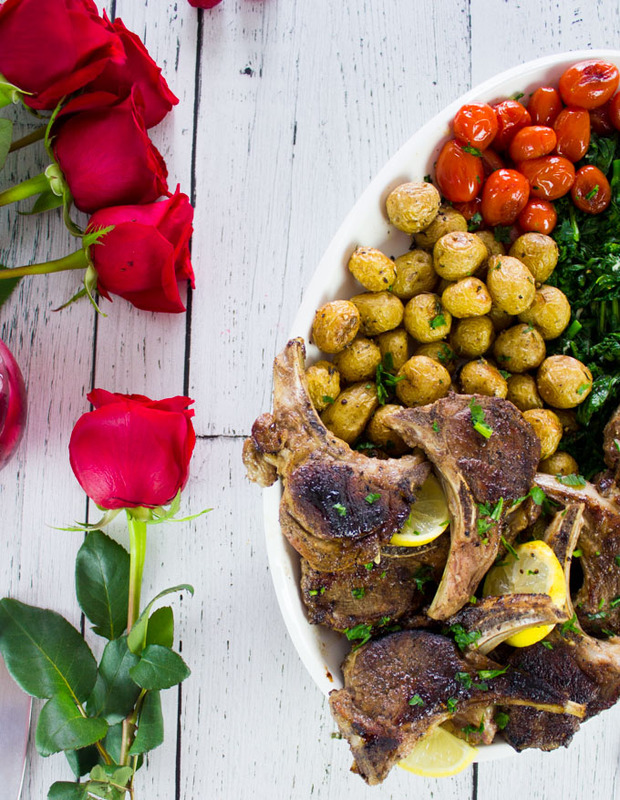 This one is a special one because it’s for Valentine’s Day and for Lamb Lover’s month which happens to be February! 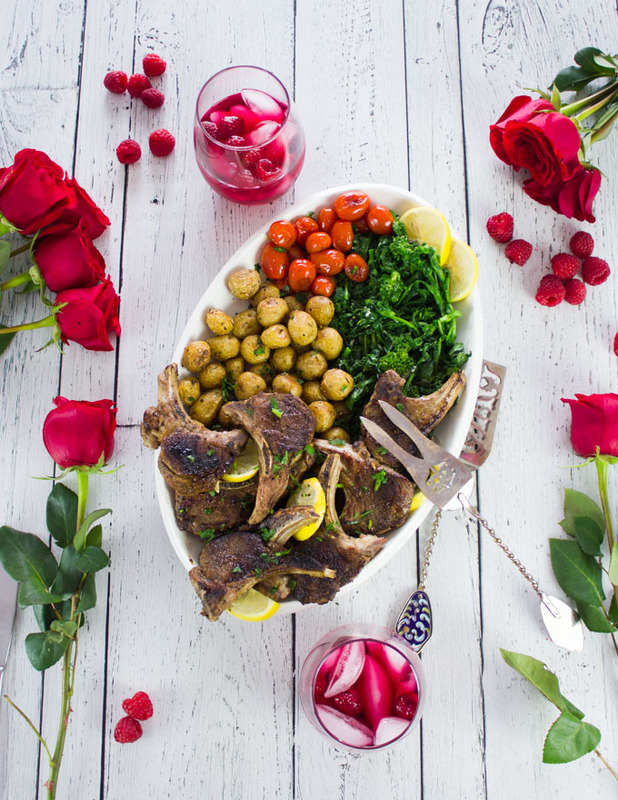 The beauty of this lamb chops platter is how easy it all comes together, how the flavors compliment each other and how fun it is to share. Before I go in to step by step making the lamb chops, I wanted to answer a few of the questions I get all the time about lamb. What’s the best lamb chops marinade? The truth is, lamb chops have such a delicate and mild flavor, that it doesn’t really need a marinade. It’s almost like the fillet mignon, where you want to taste the meat. However, I love it when lamb chops are seasoned with a dry spice blend and then served with an herb compound butter. You taste the lamb, the spices and the freshness of herbs from the butter. Lamb chops in the oven or broiled lamb chops? If I was still living in Miami, I would blindly say—grilled lamb chops. However, since we’re covered in snow for half the year in MI, I’ve looked into pan searing and oven coking lamb chops. So for a whole rack of lamb—absolutely I would sear the rack for 3 minutes or so on each side and finish cooking it in the oven at about 420 degrees. I would also do this for thick and bigger size lamb chops. 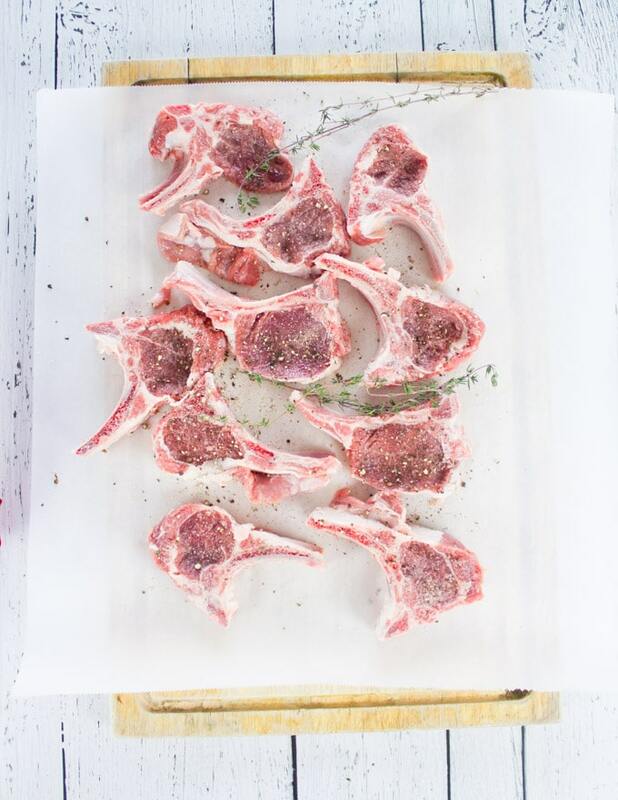 To broil lamb chops, you can set the broiler on high and broil your lamb for 10 minutes , flipping half way (depending on the thickness of your chops). Can I say anything? Because I would serve lamb chops with pasta rice, potatoes, salad, noodles, veggies, you name it! They’re like mini cuts of steaks on a bone with immense flavor. I love eating lamb chops holding them from the bone and just biting through! 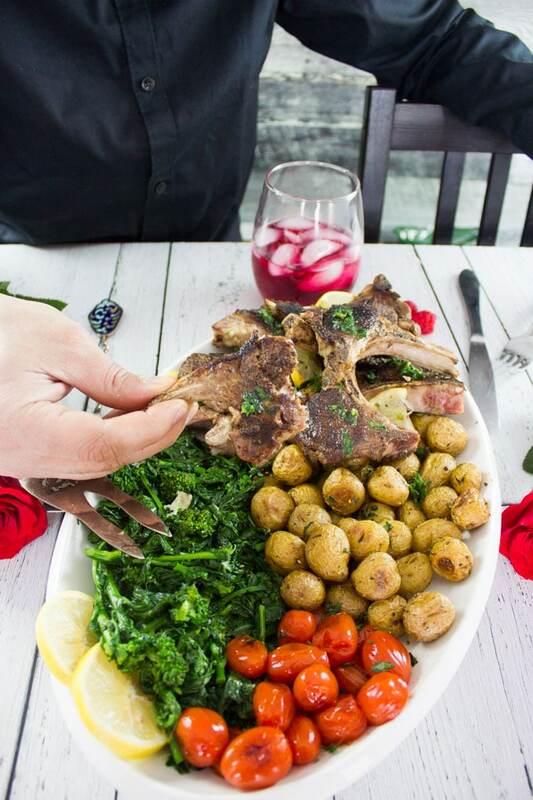 For today’s platter, I’m serving the lamb chops with roasted baby potatoes, garlic broccoli rabe and tomatoes. Finally, I just drizzle a mix of herbs and butter over the chops and the whole platter for a bright finish. If you want the simple answer, it’s more delicious and definitely more fresh. Just think of all the farmers and ranchers working day in day out, raising lamb to the highest standards and doing it all with so much love. Imagine the quality of lamb you’re getting—absolutely superior! First of all, start by roasting the baby potatoes in a 420 degree oven for 30 minutes. In the meantime you’ll sauté the broccoli rabe with plenty of garlic in olive oil, and then you’ll sauté the baby tomatoes the same way. Finally, use the same skillet to cook the lamb. Seasoning the lamb chops is completely personal. You can go with a simple salt and pepper , or you can upgrade it to salt, pepper, allspice, garlic powder and a pinch of child flakes like I did. Sear the chops for 5 minutes per side for medium rare. If you need them medium well or even well dine, then cover the skillet after searing on both sides and let the chops cook well (extra 3-7 minutes). Make the herb butter by melting just 2 tablespoons of butter (salted or unsalted) and add in 2 tablespoons of mixed minced herbs. Finally, assemble the platter and share it with someone special. Buy American lamb for quality tasting and fresh lamb. Ask your butcher to trim off excess fat from your chops. Don’t use strong marinades or seasoning with lamb chops, as they have a really delicate mild flavor. Depending on the size of chops and how well you prefer them to be done, keep an eye on the skillet as they can vary from 10-15 minutes. Finishing off the lamb chops with herb butter add flavor, freshness and moisture to the lamb chops. However, if you don’t want to use butter you can drizzle a touch of olive oil and sprinkle some herbs to finish off. Try something indulging like Pomegranate Roast Lamb Shanks or Leg of Lamb with Mashed Potatoes. 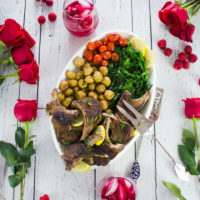 Go for something fresh like Spicy Harissa Lamb Shoulder Chunks in Pita Cones with Tahini Sauce, Fall Harvest Bowl with Lamb Meatballs Recipe or Ultimate Mujadara Recipe. 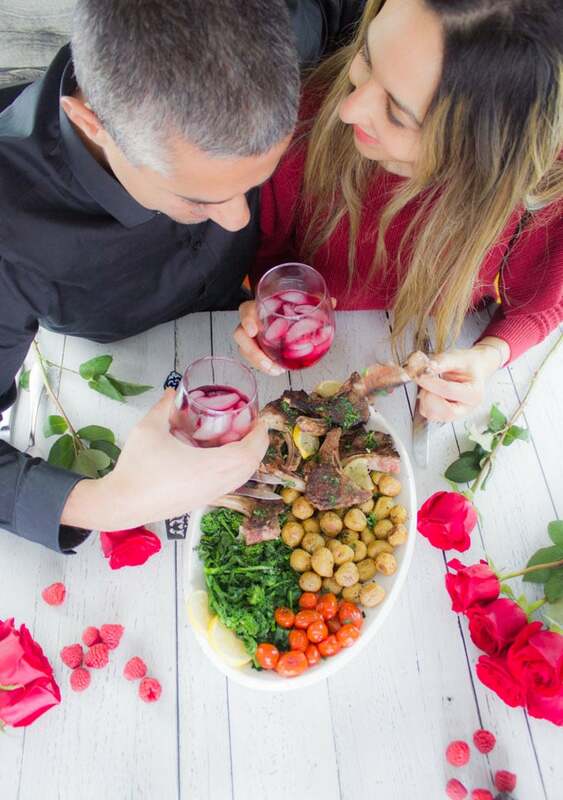 Lamb Chops are succulent, delicious, easy to prepare and serious date night food! 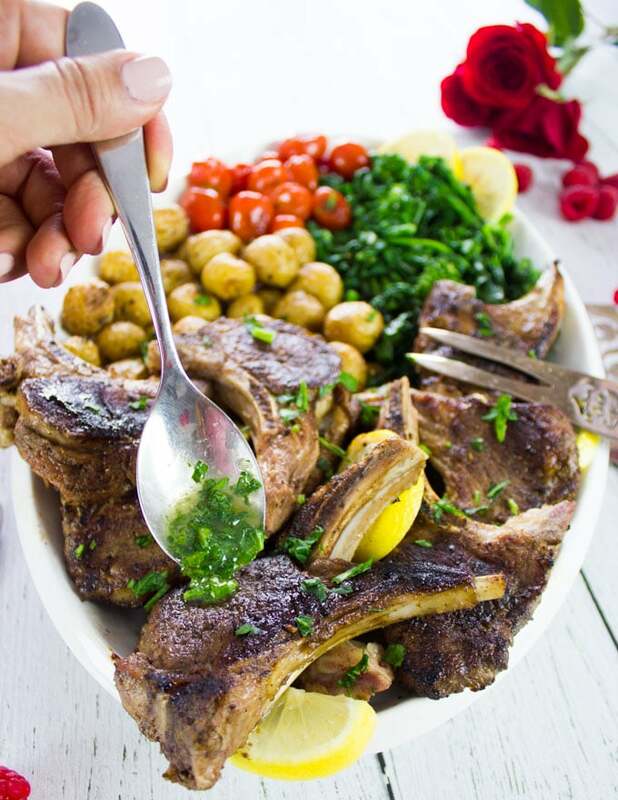 I’ll walk you through how to make this mouthwatering lamb chops platter for the most special meal! Preheat the Oven to 420 degreesF. 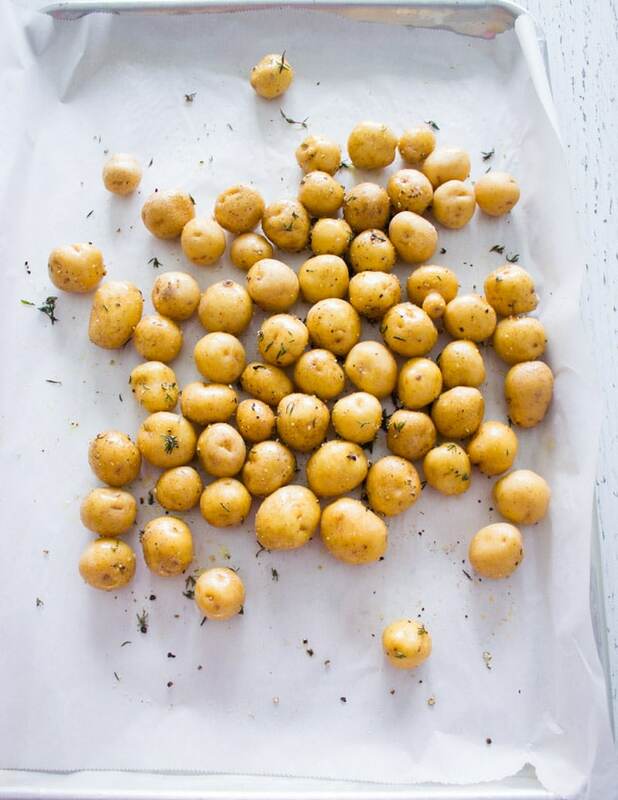 Mix all ingredients for the potatoes and place them in a single layer on a parchment lined baking sheet. Roast the potatoes for 30 minutes until tender. Preheat a non stick skillet over medium high heat and add in the olive oil and garlic, sauté for minute then add in the broccolini and toss for 3 minutes. 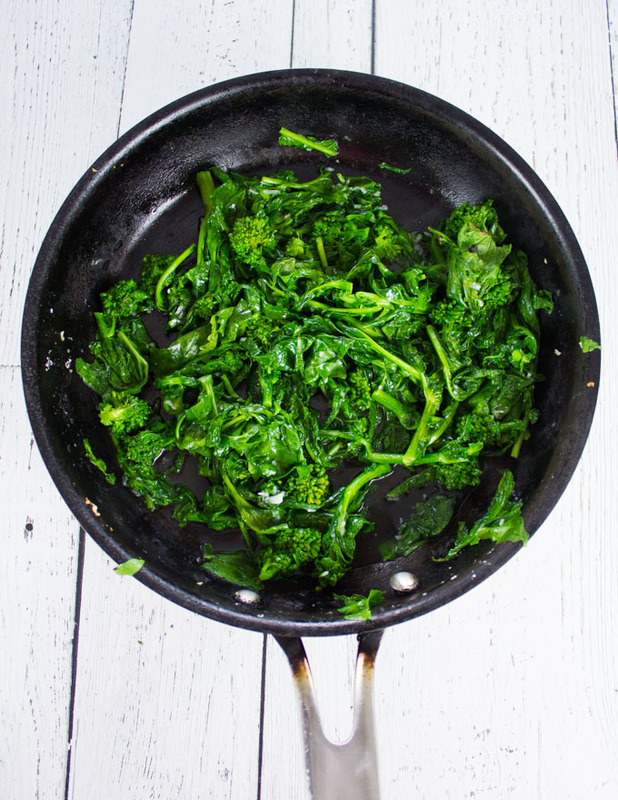 Remove the broccoli rabe and repeat the same with the tomatoes. Wipe up the skillet. Season the lamb chops with all ingredients except the oil. Add the olive oil in to the skillet and preheat the skillet over high heat. Start searing the lamb chops for 5 minutes, lower the heat to medium and flip the chops. Keep cooking the lamb chops for an extra 5-8 minutes depending on how well you prefer the chops to be. Make the Butter my mixing in the herbs. 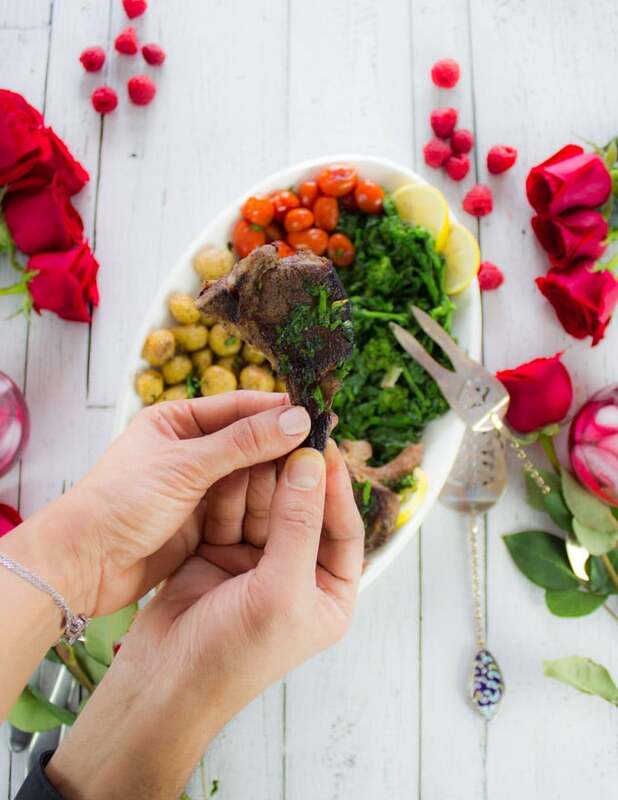 Assemble the platter by arranging the potatoes, broccoli rabe, tomatoes and lamb. Drizzle the butter over the platter and arrange some lemon slices for serving. Buy American lamb for quality tasting and fresh lamb. Ask your butcher to trim off excess fat from your chops. Don’t use strong marinades or seasoning with lamb chops, as they have a really delicate mild flavor. Depending on the size of chops and how well you prefer them to be done, keep an eye on the skillet as they can vary from 10-15 minutes. Finishing off the lamb chops with herb butter add flavor, freshness and moisture to the lamb chops. However, if you don’t want to use butter you can drizzle a touch of olive oil and sprinkle some herbs to finish off. lamb chops are seriously amazing. one of my favorite meats. i love the compound herb butter, i def need to try making that! Thanks Danielle! It’s really worth it! Thank you Gene! Hope you make it soon! 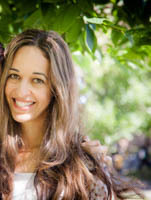 Jo thanks so much! Isn’t lamb the best!? Isn’t this just the perfect dinner platter?? I love all the components, you sure put together some of my favorites! Never had broccoli rabe (not even sure quite what it is??) but I’m guessing it tastes like broccoli so I am all in! !